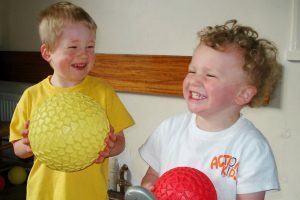 Action Kids are fun activities for preschool children up to the age of 7. Specially designed use in nurseries, reception classes, playgroups, childminders, parents etc. All the Action Kids activities lead to dance, games, gymnastics and athletics enabling children to become stronger, more balanced, better co-ordinated and confident as they develop physically, socially and emotionally. Each individual session are 45 minutes of planned, physical development and education with music, stories and fun. The activities are progressive and developmental in themselves and throughout the scheme. Sessions are in a safe environment where children develop naturally, amongst their peers through inclusive play. These activities access all seven areas of Learning and Development in the Early Years Foundation Stage and are fully inclusive. How do the sessions achieve this? 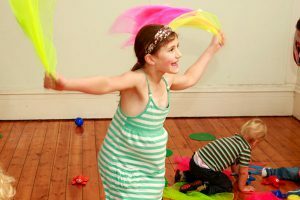 Through the use of music, action songs, puppets, balls, beanies, storytelling and much more, the children embark on imaginary journeys. Through creative play and planned activities, children learn and become stronger, more balanced, better co-ordinated and agile. By having fun with games using equipment e.g. 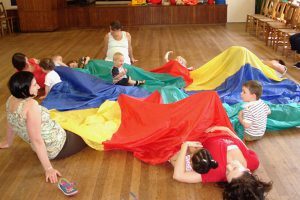 parachutes, children develop spatial awareness, social skills and the ability to cope with more than one thing at a time. The programmes are designed to stimulate both sides of the body and brain to ensure the development of well-balanced children. James' classes cover the midlands area of the UK. Heather's classes cover the Halifax and West Yorkshire area of the UK. Vanessa's classes at St Ninian's Parish Centre, Douglas, Isle of man.